I’m waiting for the tale where these two end up as roommates in an apartment somewhere. Wacky hi-jinks are sure to ensue. Note that I’m using the comiXology digital version, which does not contain any of the other stories found in the physical Free Comic Book Day release. Dr. Dinosaur convinced Atomic Robo that the Hadron Collider has accidentally disrupted space/time and the two team up with some of Robo’s graveyard shift scientist to fit it. Not surprisingly it’s a trap and Robo soon finds himself fighting a super-evolved dinosaur who has evolved missile launchers…then again Dr. Dinosaur is rarely a credible source of information. (Come to think of it that should have been Robo’s first clue something was wrong.) He’s also not very good as the “Futuresaurus Rex” attacks him as well, forcing the two enemies to team up in order to stop him. Whenever Dr. Dinosaur shows up (and I don’t know if he’s shown up outside of the Free Comic Book Day specials) you know it’s going to be a doozy of a ride and this issue is no exception. Trust me, however weird you thought this was, it’s nothing on the actual story. I don’t know if these are collected in the trades (they should be) but it is available to read on the official website. I’ve linked to the starting page for your benefit but go read the whole series. You’ll thank me later. 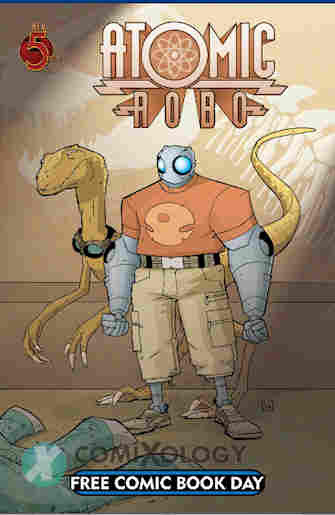 Posted by ShadowWing Tronix on April 13, 2019 in Yesterday's Comics and tagged Atomic Robo, Dr. Dinosaur, Free Comic Book Day.